ICICI loans Rs.375 million to a shell company with no income. Then Prannoy Roy, gives the shell company directors interest free loans! ICICI loans Rs.375 crores to RRPR, whose director Prannoy Roy, gives self interest free loans! RRPR (Radhika Roy Prannoy Roy) Holdings, a shell company with no income was given a loan of Rs.375 crores ($56 million) by ICICI at 19% interest. Within two days of receiving this loan, Prannoy Roy diverted Rs.21 crores ($3.11 million) to himself and Rs.71 crores ($10.5 million) to wife Radhika Roy as interest free loans. Income Tax Dept. (ITD) took a dim view of these transactions and has questioned the whole deal as an attempt to evade taxes (report at the end of the post). We wrote yesterday about how Prannoy Roy made a profit of Rs.53 crores ($8 million). 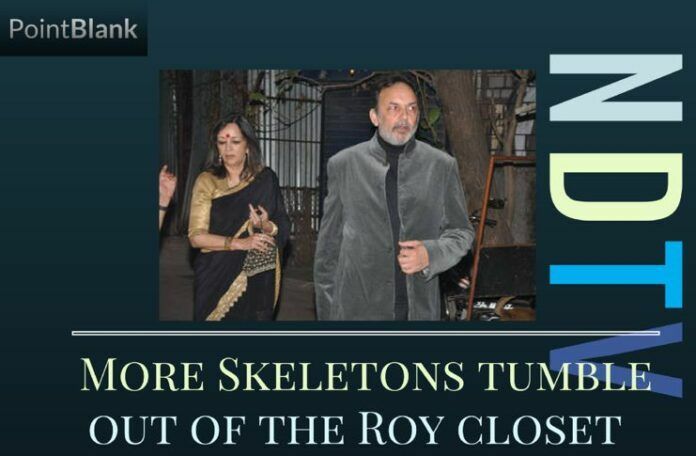 More skeletons tumble out from the closet of NDTV’s Prannoy Roy. The Income Tax Department (ITD) has found that in October 2008, within two days of receiving Rs.375 crores loan from ICICI Bank, Prannoy Roy diverted Rs.21 crores to himself and Rs.71 crores to wife Radhika Roy as interest free loans. The role of ICICI Bank was also under controversy in this murky deal because the loan was allotted to the shell company RRPR Holdings Private Limited, which controls NDTV. This implies that out of the Rs.375 crore ($56 million) loan, Rs.92 crores ($13.6 million) went to the Roy household! RRPR is a shell company with no income having 50 percent shares each by husband and wife. Based on what collateral did ICICI Bank give the loan to a shell company? The loan with 19 percent interest was received on October 14, 2008, when NDTV’s friend P Chidambaram was the Finance Minister. On October 16, the RRPL grants interest free loan to its own Directors! This is nothing but fraud. It is sure that this was done with the blessings of ICICI Bank, which gave such a huge loan to a non-income showing shell company. As per the Income Tax Report dated December 29, 2015, Prannoy Roy was granted interest free loan of Rs. 20,92,00,009 ($3.11 million) by RRPL on October 16, 2008, just 48 hours after RRPL got Rs.375 crores from ICICI Bank with 19 percent interest. The same day RRPL also gave interest free loan of Rs.71,00,00,107 ($10.5 million) to wife Radhika Roy too. This implies that out of the Rs.375 crore ($56 million) loan, Rs.92 crores ($13.6 million) went to the Roy household! Prannoy Roy has been preaching integrity in public life for the longest time, as if he was always taking the high road. Irony died a thousand deaths! Another Income Tax Report of January 29, 2016 also details the complete fraudulent operations of Prannoy Roy through the shell company RRPL in controlling and bagging money in the name of Stock Exchange Listed company NDTV. The two Income Tax Reports are published at the end of this report. PGurus already reported how Prannoy Roy siphoned Rs. 53.84 crores ($8 million) in 2010 into his personal account from RRPR Holdings after receiving more than Rs.350 crores ($52 million) from Reliance Group linked firm VCPL. Income Tax report also exposes how Prannoy Roy’s shell company told blatant lies to the Tax department. To the ITD they stated that they had attached bank transaction details and Certificates of Deposit (CD)s. But the ITD says that it was a total lie and they never attached any such documents. The systemic rot that has set in during the UPA era shows signs of continuing with a cabal of politicians cutting across political lines trying to cover up/ obstruct/ obfuscate the inquiries being conducted into NDTV dealings. It is high time this government show spine and let the law of the land do its job. 1. The conversion rate used in this article is 1 USD = 67.46 Rupees. Where is the remedy? Where is the SC appointed SIT on black money? What are they doing? Why can’t they take suo Moto notice of such reports? A climate of cynical impotance has developed where nothing seems to be working against the powerful and resourceful Mafia of Corrupt politicians, bureaucrats and the business houses. For how long will we continue watching this open loot helplessly as mute spectators? Har dal pe ullu baitha hai anjame gulistan Kya hogs? This Nation since independence politicians have thoroughly brain washed the public that corruption & loot are accepted norms.Accordingly we have framed our various laws congenial for the looters & to compliment we have an emasculated judiciary, which of late they have been displaying their political affiliations openly. The brazenness to loot has become common & their adroitness ensures zero convictions. This new govt is running out of time to throw the corrupt lobbies, foreign funded media and politicians in jail..Justice delayed is justice denied. The people of India voted in a overwhelming majority expecting justice. No point just saying/ passing remarks in election campaigns that the previous govt were crooks..Honorable BJP govt, you represent the people and the law of the land now. Please dispense justice. Publishing the reply is of no use…Let the fraud (ndtv) be closed forever…..What action the government has taken to shut this channel once forever…..?????????????????????????????????????????????? Why don’t you read the whole post and see where it is blocked? And then write to the appropriate person, cc @PMOIndia? What happened to.the case ? Why is there no criminal proceedings..is there a different law for….vips..
Why NDA took three years to take action? On the ground,government seems to work slowly,Vision is big. WELL IF TODAY WE ARE RULED BY AN EMPEROR WE ARE HAPPY THAT FINALLY WE HAVE ONE THAT IS A PATRIOT AND AN INDIAN. Finally law has taken its own course.We can imagine how much money have gone to corrupt people with blessings of congress govt.I only request that under no circumstances the most fraudulent bank the ICICI should left.The concerned officer of ICICI must be jailed. Today I read in NDTV website,an article ‘Gurumurthy and his Fake news Gang of Four’. Dear Mr.Gurumurthy,I am your fan and read all that you write in English.I want you to read it,give a strong reply with facts and figures and if possible file a case of defamation against this antinational and anti Hindi NDTV and the crook Pronnoy. Communists are after all communalists too…Only Hindus are not wanted for them..
How abt exposing the economic offenders in the Listed Companies in India, cheating crores of innocent investors (although some actively help them by artificially creating demand for such scrips) SEBI / NSE are spectators, being casual in their follow up, giving more room for such unscrupulous Cheating groups! I guess you come up with factual stories selectively ! Like most people do these days ! Usually in favor of the ruling party and the establishment ! There are no facts on crooks from the other side of the aisle ! Even an ordinary citizen like me have some facts of them !! But then today we are ruled by Emperor and everyone wants to please the emperor !! You haven’t read all our posts – When you do, you will change your opinion. Amazing how all your posts seem to be anti ndtv . Unfortunately for you your own website shows a ‘more form this author section’ . Looks like a witch hunt to me . Not one positive thing ever. we can never wake up a person who is pretending to be asleep. Alas! WELL IF TODAY WE ARE RULED BY AN EMPEROR WE ARE HAPPY THAT FINALLY WE HAVE ONE THAT IS A PATRIOT AND AN INDIAN. NOT AN ANTI-NATIONAL MUTE PUPPET OF THE WHITE WIDOW WAITRESS LOOTER QUEEN! One selfless emperor is better than a self centered dynasty. The difference is the emperor is ruling while the dynasty was ruining India. One typo error in your report ,insted of year October 2008, it is mentioned October 2018. Was fixed. Thanks for pointing it out. It was not expected from a person of his stature. This needs to be investigated into details within the framework of law and without any political bias. It is surprising why the investigation was not expedited and punish him for his alleged tax evasion. The other issue is how ICICI Bank granted loan to his shell company with no income. WHO OWNS ICICIBANK? WHO OWNS THE PRESSTITUTES AT NDTV? WHO DO THESE PRESSTITUTES FAVOR AS THEY DEGRADE HINDUS? As shown in Ardh Sathya these CROOKS remain unpunished. They would hire lawyers & lawyers thrive by defending CROOKS. Would be given bail. Assuming they are sent to prison both would be making designer candles I am sure. Their cells would be having five star facilities. Such measures offer no catharsis. Best is to make them all face a Firing Squad. No more journos left to embed themselves & report . This way Indian CRPF get a chance to ensure their weapons do not rust. Slaughter them all & export their carcasses to london school of economics , bangladesh , middle east instead of slaughtering COWS & BUFFALOES. I can write a whole essay on how much prannoy roy CROOK the brother in law of poooooooor toiling masses lllloving communist prakash karat & his fav team of bald headed shekar gupta , vir sanghvi ( who would appear in his show on bbc occassionally ) jayanthi natarajan , kushboo ( I could not believe myself when I saw the numbskull kollywood bimbo kushboo was appointed the judge once in his world this week show on bbc ) , barkha dutt , seema mustafa , yechury , javed akthar ( he was the judge once bemoaning how Vajpayee was the cause of famine in Kalahandi Orissa along with prannoy roy of london school of economics) pontificated on morality blah blah & various such blah blah with a demented audience clapping & cheering ….. Credibility takes a hit if we are expected to believe even a SOLITARY sleuth in IT dept suspected nothing. That woman power ( some kochar ) managed ICICI bank feminist power also said nothing so far. Once some escalator in India had a screw missing causing some accident . At once this london school of economics CROOK said :- ” these indians screw up everything” for which his demented audience laughed uproariously. It was Maneka Gandhi who wrote decades earlier how this CRIMINAL prannoy roy owned an abattoir in benami name slaughtering Cows , Buffaloes , Calves & exporting them to Middle East etc . These UNTOUCHABLES have always been ruling this country. Once a socialite from Delhi among the audience said ” Everyone is so corrupt…why don’t you prannoy & vir sanghvi run this country” for which he came up instantly with a mock humble shake of his head. This crook travelled to Barcelona etc etc for FREE allegedly to report on sporting event. Sir, He should be arrested and sent to the custody CID/ED for interrogation till he vomits the truth and must be hanged thereafter from the nearest Lamp post.